The CARE Card is a custom made medical alert identification card designed to educate those you come in contact with on your special needs or limitation you may have in a respectful way. The CARE Card program was created and is overseen by a medical doctor and a police detective to ensure cards are logical, pertinent and consistent with the disabilities, illness and tips that are listed. They even personally review each card before they send them to you! The CARE Card was created to fill the gaps of miscommunication and understanding between individuals with disabilities and first responders. When first responders are given information on a disability or the limitations of a medical illness, they can give the dignity to the person that is needed and helps create a positive interaction. Would you like to donate a CARE Card to someone who is less fortunate? You can by clicking below! Use your CARE Card for more than emergency contacts. You can use the card with any customer services interaction, letting employees know the tips and limits you wish to share. 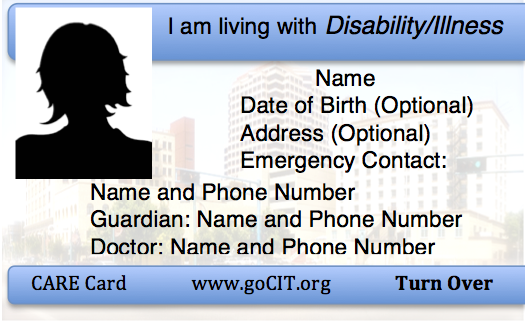 Ask “I have a disability identification CARE Card, may I show you?”. Have you shied away from outings because you have difficulty with interactions? Start each interaction with showing the person your CARE Card and let them open the dialog with you. Once we receive your e-mail with your information we will send you an invoice for your custom CARE Card. Once payment has been received the card will be designed and a proof will be sent to your email. Once you let us know the proof it good and we will create your card and mail it out to you. All cards are created in house, we do not mail out or have third party vendors creating your custom card. A CARE Card is not a government identification and should not be used to replace one. 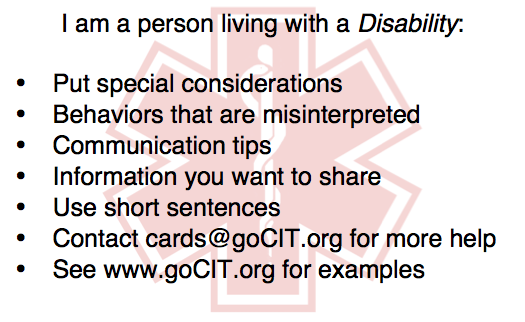 A CARE Card is not an official form or proof of disability or illness and should not be used as such. These cards are not medical devices nor legal documents. CARE cards are not a substitute for legal or medical advice. They are not considered proof of diagnosis. CARE cards are not to be used as mitigation in the cause or course of any crime. We do not maintain records of your information. We do not sell, give out, share or post your medical or personal information. Do not reach for a CARE Card during face-to-face contact with law enforcement with out receiving approval to do so. Please note that our policy is to permanently delete your information after the card has been created. We do not maintain files on your medical information. If you wish to re-order a card you must provide your information again. Although this might be frustrating at times, it offers the most protection for you and your personal medical information. To see more examples of cards please click here.